After this I looked, and there was a great multitude that no one could count, from every nation, from all tribes and peoples and languages, standing before the throne and before the Lamb, robed in white, with palm branches in their hands. They cried out in a loud voice, saying, "Salvation belongs to our God who is seated on the throne, and to the Lamb!" And all the angels stood around the throne and around the elders and the four living creatures, and they fell on their faces before the throne and worshiped God, singing, "Amen! Blessing and glory and wisdom and thanksgiving and honor and power and might be to our God forever and ever! Amen." Then one of the elders addressed me, saying, "Who are these, robed in white, and where have they come from?" I said to him, "Sir, you are the one that knows." Then he said to me, "These are they who have come out of the great ordeal; they have washed their robes and made them white in the blood of the Lamb. For this reason they are before the throne of God, and worship him day and night within his temple, and the one who is seated on the throne will shelter them. They will hunger no more, and thirst no more; the sun will not strike them, nor any scorching heat; for the Lamb at the center of the throne will be their shepherd, and he will guide them to springs of the water of life, and God will wipe away every tear from their eyes." 1 I will bless the LORD at all times; his praise shall ever be in my mouth. 2 I will glory in the LORD; let the humble hear and rejoice. 3 Proclaim with me the greatness of the LORD; let us exalt his Name together. 4 I sought the LORD, and he answered me and delivered me out of all my terror. 5 Look upon him and be radiant, and let not your faces be ashamed. 6 I called in my affliction and the LORD heard me and saved me from all my troubles. 7 The angel of the LORD encompasses those who fear him, and he will deliver them. 8 Taste and see that the LORD is good; happy are they who trust in him! 9 Fear the LORD, you that are his saints, for those who fear him lack nothing. 10 The young lions lack and suffer hunger, but those who seek the LORD lack nothing that is good. 22 The LORD ransoms the life of his servants, and none will be punished who trust in him. When Jesus saw the crowds, he went up the mountain; and after he sat down, his disciples came to him. Then he began to speak, and taught them, saying: "Blessed are the poor in spirit, for theirs is the kingdom of heaven. "Blessed are those who mourn, for they will be comforted. "Blessed are the meek, for they will inherit the earth. "Blessed are those who hunger and thirst for righteousness, for they will be filled. "Blessed are the merciful, for they will receive mercy. "Blessed are the pure in heart, for they will see God. "Blessed are the peacemakers, for they will be called children of God. "Blessed are those who are persecuted for righteousness' sake, for theirs is the kingdom of heaven. "Blessed are you when people revile you and persecute you and utter all kinds of evil against you falsely on my account. Rejoice and be glad, for your reward is great in heaven, for in the same way they persecuted the prophets who were before you. Today the church remembers All Saints. 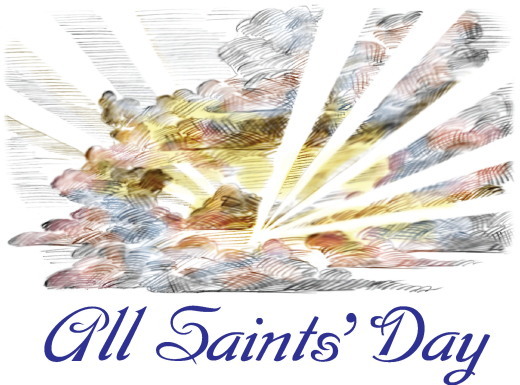 All Saints' Day, also known as All Hallows' Day, Hallowmas, Feast of All Saints, or Solemnity of All Saints, is a Christian festival celebrated in honour of all the saints, known and unknown. In Western Christianity, it is celebrated on 1 November by the Roman Catholic Church, the Anglican Communion, the Methodist Church, the Lutheran Church, and other Protestant churches. Our English word "saint," derived from the Latin sanctus, is used in a variety of ways. Literally it means holy, set apart for God, consecrated, or dedicated. In the New Testament, hagios, the Greek word for saint, is used to refer to all baptized Christians, many of whom were far from exemplary. 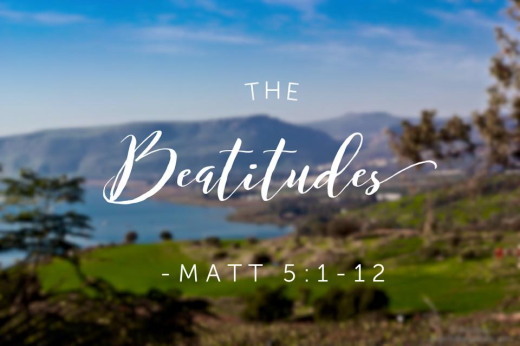 Paul sometimes scolded the saints for their corrupt and decadent ways. When we use the word saint in the context of All Saints's Day, we refer especially to those Christians who have lived such hallowed lives, yielding so fully to the Holy Spirit, showing such love for God and his human creatures, that their examples are treasured and emulated. These individuals are the champions of Christ and his church and the heroes of the faithful. Help us to take seriously our own vocation as saints, as the holy ones of God. Amen. Almighty God, you have knit together your elect in one communion and fellowship in the mystical body of your Son Christ our Lord: Give us grace so to follow your blessed saints in all virtuous and godly living, that we may come to those ineffable joys that you have prepared for those who truly love thee; through Jesus Christ our Lord, who with you and the Holy Spirit lives and reigns, one God, in glory everlasting. Pray that Christ will give you what Scripture calls “an honest and good heart,” or “a perfect heart,” and, without waiting, begin at once to obey him with the best heart you have. Any obedience is better than none. Any profession which is disjoined from obedience, is a mere pretence and deceit. Any religion which does not bring you nearer to God is of the world. You have to seek his face; obedience is the only way of seeking him. All your duties are obediences. If you are to believe the truths he has revealed, to regulate yourselves by his precepts, to be frequent in his ordinances, to adhere to his church and people, why is it, except because he has bid you? And to do what he bids is to obey him, and to obey him is to approach him. Every act of obedience is an approach – an approach to him who is not far off, though he seems so, but close behind this visible screen of things which hides him from us. He is behind this material framework. Earth and sky are but a veil going between him and us. The day will come when he will rend that veil, and show himself to us. And then, according as we have waited for him, will he recompense us. If we have forgotten him, he will not know us. But “blessed are those servants whom the Lord, when he comes, shall find watching... He shall gird himself, and make them sit down to eat, and will come forth and serve them. And if he shall come in the second watch, or come in the third watch, and find them so, blessed are those servants” (Luke 12:37, 38). May this be the portion of every one of us! It is hard to attain it; but it is woeful to fail. Life is short; death is certain; and the world to come is everlasting. Pray that Christ will give you what Scripture calls “an honest and good heart”. Hello my dear brothers and sisters, lovely and strong in faith. On Saturday I went to court, but my session was not held. I met then two persons. I became very happy when they introduced themselves [as my] defence attorneys…I immediately felt joy in my heart, like somebody gave me comfort, like stars, like lights. I one hundred percent believe it was the Holy Spirit healing my heart. He told me, “You know your punishment. It’s death.” I told him, I am one hundred percent ready for the sake of my faith. My Saviour gave his life for me. I am not afraid of a human; he just kills my body, but does not hurt my soul. I am afraid of my Lord and Savior; He will be able to punish my soul too. I told him I am holding on to my faith. I will never betray my faith. Without Jesus, what does the life in this world or the afterlife mean? Nothing! “I can do everything through him [Jesus] who gives me strength,”. As I stood on the edge of the platform eyeing the disappearing earth below, I had a choice. I could say, “no thanks” and ask to be released from the cable, or I could jump. I chose to jump. My body flew over the treetops and the stunningly beautiful gorge. I was Tarzan’s Jane and this was my jungle. Airborne. Exhilarating. Risky. Jacob was with us that day. He was a stranger among our little band of adventurers. Jacob was alone. No friends. No spouse. No family. “Jacob, what brings you up to this mountain today?” I asked. “I’m afraid of heights,” he answered. I then noticed the thin line of perspiration beading over his upper lip. The slight tremble in his voice. The mechanical one-foot-in-front-of-the-other halted gait up the hill. “I’m going to conquer it today,” he determinedly answered. I was struck. We were here to have fun. He was here for a totally different reason. When Jacob stood on that platform, I prayed for my new friend. For Jacob this was not just a joy ride…or just maybe it was. I’m not saying that God told Jacob to go to the top of a mountain, attach his body to a flimsy cable, and fly over the gorge at the risk of life and limb. But I am saying that obedience often requires a leap of faith that feels just like it. Too often we say “yes” to God, but live the “no” because of fear. We stand at the precipice of belief and have to make a decision. Am I going to trust God or not? Am I going to attach my heart to the cable of His love and take a leap of faith, or am I going to freeze in fear because I don’t trust that He has my best interests in mind? Am I going to settle for safety and miss the thrill of seeing God work through me? Or am I going to live the “yes” and experience life to the full? As we live and move and have our being in Jesus, God will take us to some amazing places. And there will always be a choice. Will we jump headlong into the adventurous journey of His perfect plan, or will we hang back for lack of faith? Jacob stood on the platform, took a deep breath, and jumped. He flew over the treetops, careened over the river, and landed safely on the other side of his greatest fear. We clapped and cheered. Jacob took a bow. God smiled. In Him we live and move and have our being…and sometimes we soar. Lord, sometimes I’m just flat out afraid. Afraid I’ll fail. Afraid I’ll be rejected. Afraid I won’t be good enough. Forgive me for focusing on my weaknesses rather than Your strength. Today, I’m believing that I can do all things that You call me to do because I know that You will give me the strength I need. 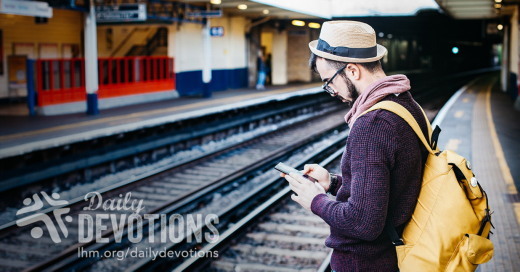 Is there anything in your life that God has called you to do that you haven’t done? LHM Daily Devotion - November 1, 2017 "God's Protection"
As far as I can tell, there are two kinds of guardian angels. The first..
As far as I can tell, there are two kinds of guardian angels. The first kind of guardian angel is the kind spoken of in the Bible. You have the familiar verse from Psalm 91, which I just read. But, there's more than that. Jesus spoke of the children's guardian angels when He said, "See that you do not despise one of these little ones. For I tell you that in heaven their angels always see the face of My Father who is in heaven" (Matthew 18:10). We dare not forget Exodus 23, which says there was a guardian angel assigned to the children of Israel: "Behold, I send an angel before you to guard you on the way and to bring you to the place that I have prepared" (Exodus 23:20 ). And Daniel, freshly rescued from the den of death, reports: "My God sent His angel and shut the lions' mouths" (Daniel 6:22a). And the second type of guardian angel? Well, this type of GA is a special human being who shows up and, often, quite unexpectedly, does the Lord's work. Recently, St. Louis saw the work of a guardian angel. Here's what happened: a man was being pushed by his wife in a wheelchair. They made it as far as the railroad tracks in Kirkwood, Missouri, where the man's chair got stuck on the tracks. The wife couldn't move forward or backward, which was a problem because a train was coming, and it was coming fast. Julie and Chandler Flanders were watching from their car when a lady came out of nowhere and ran to the fellow in the chair. The woman picked up the man and his chair and moved them to safety. By the time Julie and her brother made it to the man, the train was half way through the crossing-and the woman who lifted the chair-bound man to safety? Nobody got her name, and she was gone. The work of a guardian angel? Most definitely! Earthly or heavenly? Who can tell? My friends, the truth is you have a Lord who loves you very much. His Son's life, suffering, death, and resurrection are proof of how much He is concerned about your eternity. But, we make a great mistake if we think the Lord's care and compassion is reserved only for the hereafter. The Triune God cares for you, and your guardian angel is just the way He shows His concern. What, you've never seen your guardian angel? I'm not surprised. Most prefer to work anonymously. But let me ask, have you ever almost been in an accident, but somehow, someway, managed to be spared? Now it is possible you avoided that accident because of your lightning-fast reflexes and tremendous skill behind the wheel. But maybe not. Here's another: please list all the times you haven't tripped, all the illnesses you didn't catch, all the friends who didn't betray you, all the jobs from which you weren't fired. You can't do it, can you? That's because those things never happened. Was it luck or fate? That's what some would say. Me, I know the Lord gives His holy angels charge over us to keep us in all our ways. THE PRAYER: Dear Lord, for all Your blessings, including all the bad things of life from which I have been spared, I thank You. May I rejoice in these things, and the Savior who is with me always. In Jesus' Name I pray. Amen. CPTLN Devocional de 01 de Noviembre de 2017 - ¿Cómo es Dios? Amados, amémonos unos a otros, porque el amor es de Dios. Todo aquel que ama, ha nacido de Dios y conoce a Dios. Era uno de esos momentos en los que la mamá pensó que la hija estaba demasiado silenciosa, por lo que fue a ver qué estaba haciendo. Al ver que la niña estaba sentada en una mesita dibujando, la mamá se quedó tranquila. "¿A quién estás dibujando?" le preguntó. "A Dios", le contestó la niña. La mamá le dijo: "Pero nadie sabe cómo es Dios". Sin levantar la vista de lo que estaba haciendo, la niña le contestó: "Ya van a saber cuando termine de dibujarlo". Si bien esta es una historia vieja, transmite una verdad muy importante: todas las personas, incluyendo a los incrédulos, tienen una idea de cómo es Dios. Algunos lo pintan enojado y malo, otros le ponen cabello largo o una barba blanca, y aún otros lo imaginan como un espíritu. Pero ninguna de esas ideas describe adecuadamente al Dios que yo veo en el centro de mi alma. Yo pienso que Dios luce como el amor. Ahora que estoy entrado en años, me pongo a pensar en las muchas personas de las cuales he recibido amor: mis padres, mi esposa, mis hijos, mis amigos, mis maestros, amigos en mis parroquias, ocasionalmente algún extraño. He recibido amor de muchas formas, pero el amor más puro y fuerte de todos me ha llegado en la persona de Jesús. Cuando veo al Hijo de Dios dejar el cielo para nacer en un establo, veo su amor. Cuando lo veo orando en el Jardín de Getsemaní, veo su amor. El amor del Padre lo veo en el sacrificio de su Hijo en la cruz, y en el día de la resurrección su gran amor proclama la mayor victoria de todos los tiempos. Victoria que Jesús ha compartido con usted y conmigo. Dejemos que los artistas pinten a Jesús como quieran. Yo, por mi parte, siempre lo voy a pintar con amor. ORACIÓN: Querido Dios, tu amor me cubre, me mantiene seguro y me da paz. Ayúdame a pintar la pintura de tu amor por el mundo ante quienes me rodean. En el nombre de Jesús. Amén.